Tuesday, 26 March 2019, 6:15p.m. 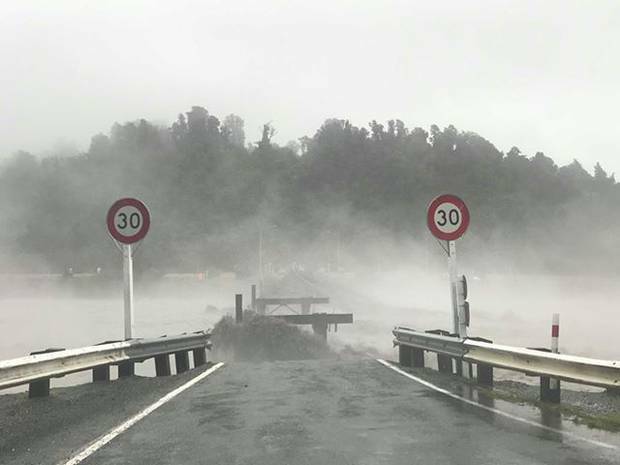 Torrential rain and strong winds have battered the South Island region, forcing emergency services to close roads and evacuate members of the public. Half a metre to 700 millimetres has fallen in some of the regions catchments. The river was running at a level of 7.6m, but has dropped back 0.7m from its peak. NZTA Network Manager for the West Coast, Colin Hey says until water levels drop it'll be hard to tell exactly what damage was done. "Bailey bridges are usually fairly quick to put back up, so we're confident that we can get it back within a week or two anyway." Hey says motorist should stay off the roads. "Travel only if's essential. You won't be able to get along the highway at all, certainly not tonight." Elsewhere, the Haast River neared a high-level mark but levelled off at 7.6m, which matches its record high. However, the Hokitika River continues to rise, sitting at 5m currently. "This is a 100-year event, there is a huge amount of rain. I haven't seen all of the rivers impacted in Westland at exactly the same time," he said. West Coast Civil Defence controller Andy Thompson told Larry Williams that the West Coast has effectively being cut in half by the collapse of the Waiho River Bridge. "That bridge is gone and there are no alternative routes up and down the West Coast." Anyone in Haast at the moment is essentially stuck, he says. There are 32 tourists displaced in Haast who are being looked after. Thompson says that people who self-evacuate should ring the police or Westland Civil Defence. A number of roads and schools have been forced to close with rivers throughout the West Coast running high, many reaching alarm levels.